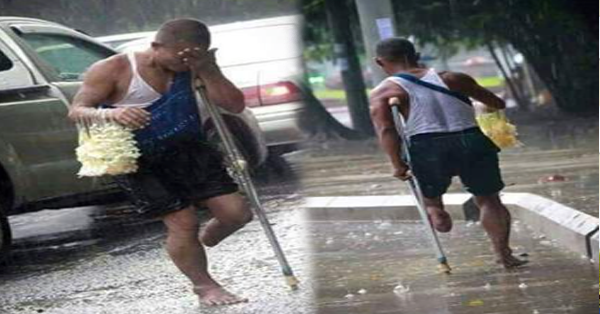 A Surprising Man with Disability Working in the Rain Caught in Action! 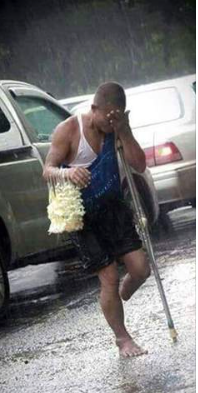 In the middle of heavy rain somewhere in Manila, this man got the netizens shocked again because despite of his disability he still manage to sell sampaguitas. It's nice to see acts like these because, like this old man, he inspires us to strive harder even though we are facing a difficult phase of our lives. He encourages us to work legally inspite of the adversity to earn money nowadays, unlike other people, yes they were rich and have plenty of money but earns it in a negative way they maybe abusing other people or gets it illegally. The man in this picture may don't have everything he wants in life but i guarantee that he has a good heart just to support the needs of his family. 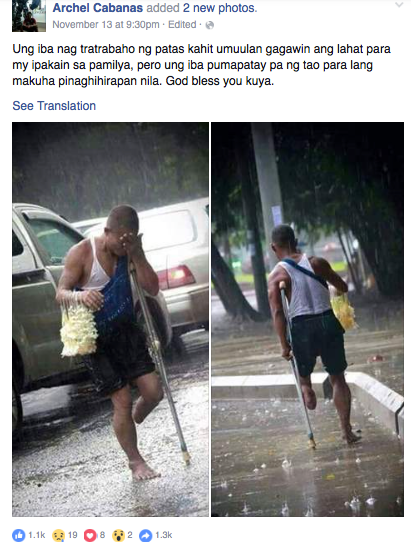 Don't you think, that instead of giving many "likes" to manong and wonderful comments, i think we should help him out, support his medical needs, give him even a small business to lessen his pain in walking and selling sampaguitas for just a small amount of money. Spread this! And we might know where he is. This man deserves some relief. This leaves a message that we should always remember in this life, "Never lose hope."